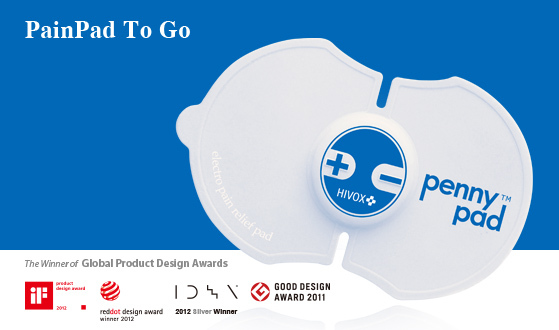 Since HIVOX announced the world's first one-piece structure TENS (Transcutaneous Electrical Nerve stimulation) device in 2007, PainPad, this brand-new innovation successfully overturns the stereotype of TENS in the people’s mind, and leads the people to understand how great the TENS therapy is for their daily pain. Incorporating the professional TENS program, PainPad is such slim & light but able to relieve the pain so quickly. Brilliantly combined with the medical grade silicone & plastic housing, and uniquely designed under the unibody structure, both features bring out the ergonomic design to fit the body contour perfectly. Besides, PainPad can be used discreetly under the clothing. It's like always being there to aid the people, no matter when working, resting or moving around. No side-effect and drug-free therapy, PainPad is given as understanding to support what the people desire and concern for the daily-pain. This brand-new wearable solution of TENS therapy now is continuing to change the people’s life with less painful but more colorful.